The most important thing for a wedding guest it to look stylish and cool. Be careful about the wording of the wedding invitation, so you can make a right decision about how your wedding attire look like. Here are a few rules for a wedding: First, do not wear something white to a wedding, because the white bride is the spotlight. Second, be respectful to the local customs, it is not a good idea to show too much skin in a church wedding. Third, it is better to be overdressed than underdressed. 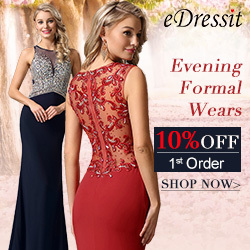 If you are going to attend a formal wedding party, long formal gowns are must-haves, but this does not mean you have to sacrifice comfort,, try to select chiffon or stretchy fabric dresses which are soft and easy o dance at night. One sleeve gown with white lace top. It does not matter that this dress includes white lace bodice. The beige skirt will distract you from the bride. Red long gown. This sleeveless fitted red gown will flatter your figure in a best way. The fabric is a little bit stretchy which is also comfortable to wear. Don't shy away from little black dress. This stylish lace bodice little black dress will give you a stunning look. Now wearing black to a wedding is totally appropriate. Sparkling gown. Refresh your look in this beige beaded gown. Make a bold move into this dress for a princess look.